You know that our Darwinex Lab runs 24/7 to grant you with the best possible tools and metrics to analyze, assess and compare trading strategies... and Darwins. I am dropping a line to introduce you to these 2 new chaps that I think you’re all going to get along. Both of them are going to fill these missing gaps you might have noticed in the Darwin profile. Although all Darwins come with the same target risk, set at 10% monthly VaR, this does not mean that they have the same volatility. Let me explain this point: The D-leverage per position of a strategy trading only few and fleeting trades, will not be the same as a strategy that’s always in the market. Both of them have the same target risk but they need different levels of volatility to reach the target risk (10% monthly VaR). The former one will yield a higher average D-Leverage per position and therefore will be more volatile, when they in the market, than the latter one. FYI, we calculate this metric by going back 1.5 D-periods of Ex. Please, let me know what you think about these two newborns and feel free to ask all the questions that might have arisen. FYI, a number over 1 means that it has statistically beaten 68% of random strategies. A figure over 1.65 has statistically defeated 95% of arbitrary strategies and a number over 2 has statistically beaten 99% random strategies. It is just a way to represent return, so it makes more sense as is now: red for negative and green for positive. We´ll look into it with the dev team. Deposits and withdrawals does not have to make a considerable impact on the Darwin D-leverage. Also LSC is affected by those jumps. Please guys, accept our apologies for this. It's being handled as I speak so the average D-leverage curves will be all smoothed out ASAP. But why not show the Sharp Ratio and the Profit Factor also? @JesusDarwinex let me only clarify and confirm my understanding with one question about the value and chart of d-leverage per position shown. I think that it could help the understanding the concept of this chart for everybody. This d-leverage (STRATEGY) with the time in market of this positions is used to the calculate the VAR of the underlying strategy. By the way, I completely agree that the d-leverage that you have to shown in this new chart and value, is the d-leverage of the darwin, as you did, because if not, it wouldn't be comparable between all the darwins. I like the Return / Risk feature. Will the Return / Risk feature also be included in the filter criteria? BTW I cannot see any advantage in filtering by Return/Risk instead of filtering by Performance. 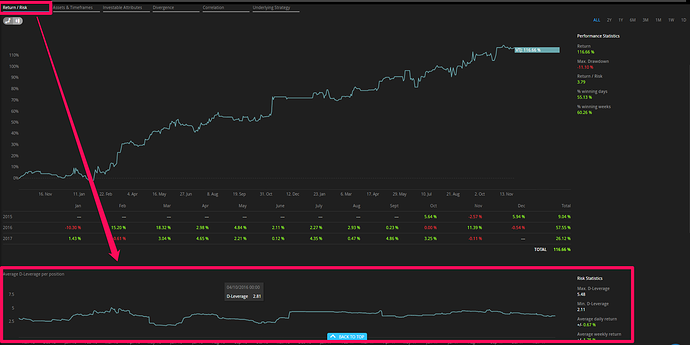 You can also filter by the "Return / Drawdown ratio" in different periods which calculates the absolute ratio in %. A value of 2 means that a Darwin made double return (for example 30%) than drawdown (for example 15%). I use it with value 2 on the 2 years time range. The Return / Risk figure compares against synthetical random strategies, and both filter criteria with a value of 2 could find excellent Darwins - if there are any . It is helpfull but maybe I don't understand the "Return / Drawdown ratio". If I for instance try to find darwins with a return/drawdown (return darwin divided by the max drawdown of the darwin) no greater 3 no matter what the actual return of drawdown is. How kan I find them? I think you understood it right. You have to select a time range (monthly to 2 years) as usual in the filter criteria of "Return / Drawdown ratio" where you enter the "3". With the time range you define the start value of the figure until today (or the last calculation of it). If you want the worse ones than 3 use the "To" Value to enter it, otherwise you enter the "3" as from value so that you will also get the better ones. That means that you would also get the Darwins with 10 % profit and 3 % DD. Filters don't work correctly and show wrong results on specific criteria! In fact, it is a kind of Sharpe Ratio "à-la-Darwinex" since this metric shows the risk-adjusted return with a target risk set at 10% monthly VaR.